Serviceteam Ltd - Appliance Services/Repair, Bathrooms, Central Heating Engineer, Electrician, Household Water Treatment, Painter/Decorator, PAT Testing, Plumber, Roofer based in Hounslow, Middlesex. DISCOUNT FOR ALL CHECKATRADE CUSTOMERS on Gas & Heating, Plumbing, Electrical, Handyman, New Boilers, Safety Certificates & Roofing | 24/7 EMERGENCY OUT OF HOURS. FINANCE OPTIONS - On new boiler installs - Visit our website for more details or call us to enquire now! 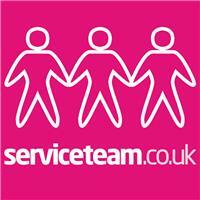 Welcome to Serviceteam where you can find out all about OUR TEAM and see our excellent customer reviews! Benefit from using our Team of friendly Property Maintenance Engineers with specialties in HEATING, GAS, CENTRAL HEATING, BOILERS, HANDYMAN, BUILDING, ELECTRICAL, PLUMBING, PAINTING & DECORATING AND CARPENTRY. Available 24/7, 365 days a year to tend to your general and emergency needs. Serviceteam Ltd are based in Isleworth, Middlesex and cover the London, TW, KT, UB & HA post codes. Our Expert Engineers take pride in providing our valued customers with high quality workmanship, clear and effective communication, fantastic customer service and a ready smile. We know that these type of works are normally surrounded with stress for our customers, so we’re here to provide a service that will ease your stress. We offer an around the clock service for emergency homecare property maintenance for all situations available 24/7, 365 days of the year. Simply call 020 8640 7907 or request a call back via our website and we’ll have one of our local emergency engineers out to you ASAP and all our work is guaranteed.